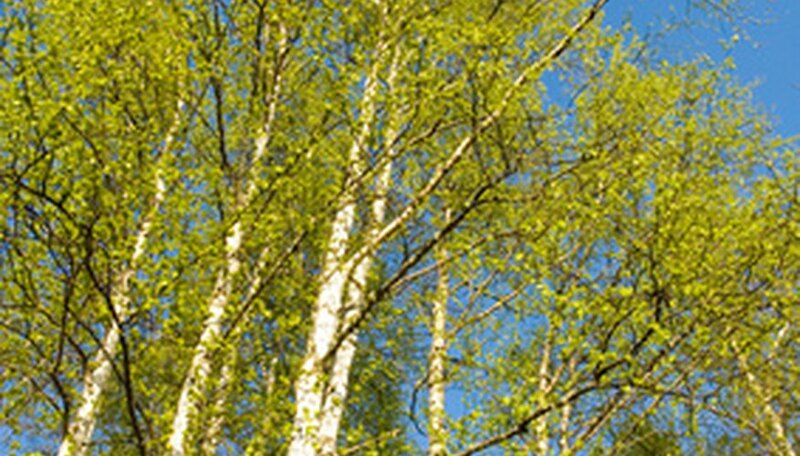 What Is the Habitat of Birch Trees? When considering a birch tree for your landscape design it is important to understand and provide the correct environment. To do this you will need to choose the proper location and the right species of birch tree for that location, follow a program of fertilization and watering to maintain a healthy tree, and check and control any insect infestations. Birch trees are popular due to their airy and somewhat delicate foliage, as well as for their interesting bark characteristics. The paper birch has white, paper-like bark; the river birch has peeling bark. There are numerous species of birch tree, each with their own bark colors, shape and form, and pest susceptibility. Birch trees share some common characteristics: they are a medium-sized tree that reaches a height of from 40 to 50 feet, their leaves turn yellow in the fall season, and they can be purchased with a single stem/trunk or as a clump birch, which has from three to five stems/trunks. The natural habitat of a birch tree is along a riverbank. It grows well in its natural habitat because the shallow root system has access to lots of moisture, and the crown of the tree receives lots of sunlight. When these two requirements are met the birch tree flourishes. The base of the tree should be protected from heat; the crown should receive lots of sunlight. Generally, these requirements are satisfied when the tree is planted on the north or east side of the house, and when 3 to 4 inches of mulch are applied around the circumference of the tree (from the trunk of the tree to the drip line); this will help to keep the moisture in the soil. Birch trees also require well-drained slightly acidic soils, where the pH is from 5.0 to 6.5. Mulching is extremely important for several reasons: mulch keeps the moisture in the soil, keeps the soil temperature cool during the heat of the summer months, keeps weeds down, and adds organic material to the soil. Watering is also important; supplemental deep watering during dry conditions will be necessary. (Avoid infrequent light watering.) Mulch and proper watering provide a healthy habitat for the birch tree. Fertilization should only be done when there is a nutrient deficiency, to quickly establish a new planting or to replenish nitrogen. Some birch trees are susceptible to insect infestations by two common pests: the birch leafminer and the bronze birch borer. An infestation by the leafminer will result in brown leaves. It is cosmetic in nature and will not kill the tree. (Insecticides can be applied to control the infestation.) An attack of the bronze birch borer can kill the tree. Symptoms such as stunted and sparse foliage can be seen in the upper crown of the tree. This leads to twig and branch dieback. If the infestation is diagnosed early, trees can be saved through the use of insecticides.